It’s ironic but without the votes of the Democratic Unionist Party from Northern Ireland, Brexit would now be well and truly buried. Often mocked for being parochial “backwoodsmen” they are playing a pivotal role in the campaign to have Government respect and enact the decision to leave the EU. 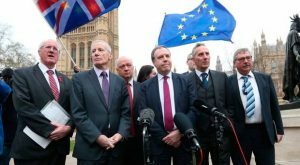 The 10 DUP MPs are providing a bulwark for Brexit against the traitorous Remain Parliament. Just consider the results of the “Indicative Votes” from last night. Leaving the overwhelming rejection of the “Revoke Article 50” SNP directed insanity to one side, you can see how those 10 DUP votes are making such a difference. And it’s not JUST last night’s votes where the DUP have put steel into the LEAVE spine; Throughout this process the DUP has insisted it will not endorse Theresa May’s toxic Withdrawal Agreement. This has encouraged some of the more solid ERG members to also hold firm. Sadly Jacob Rees Mogg and Boris Johnson showed they were quite happy to betray the DUP last week when they trotted like good little boys into the lobby WITH Theresa May in support of a “Deal” that they knew would destroy the Union. Rees Mogg is particular had stated he would *not* go against the DUP – but he did. A snake. Some may wonder why is it the DUP are so resolute? It’s simple. Theresa May’s Withdrawal Agreement will turn Northern Ireland into a colony of the EU and split it away from Great Britain. The DUP has one central focus – preserving the Union. May’s deal will destroy that Union and the DUP knows it. They also recognise that a Customs Unions runs directly counter to the wishes of those who voted to Leave the customs union so again the DUP can be relied upon to stay the course. In the final analysis Brexit is being kept alive by the principled stance of the DUP. A debt of honour is owed by all 17.4m Brexit voters to these man and women from Northern Ireland.